"These doughnuts are a classic breakfast item. Flavor your glaze with chocolate or maple spread for different flavors." In a small bowl, dissolve the yeast in 1/2 cup lukewarm water. Set aside until bubbly, about 10 minutes. In a large bowl, dissolve shortening in 1 cup of boiling water. Cool to lukewarm. Mix the evaporated milk, eggs, nutmeg, sugar and salt into the shortening and water. Stir in the yeast mixture and one cup of the flour until well blended. Gradually mix in remaining flour 1 cup at a time until dough is firm enough to remove from the bowl. Knead for about 5 minutes on a lightly floured surface, or until smooth. Let rest for 10 minutes. Roll the dough out on a floured surface to 1/4 inch thick. Cut into strips 1 inch wide and 6 inches long. Place onto waxed paper, and let rise until doubled in size, about 1 hour. Heat oil in a deep-fryer or large heavy skillet to 350 degrees F (175 degrees C). Carefully remove the Long Boys from the waxed paper and place a few at a time in the hot oil. Fry for about 3 minutes per side, or until light brown. Set over wire racks to drain. Drizzle with glaze. To make the glaze, mix the confectioners' sugar with enough water to make it able to drizzle in a long strand. Adjust amounts if necessary. Step up your bread game with homemade, no-kneading-required English muffins. These did not work for me. I tried everything to get them to rise. They were like sticks. 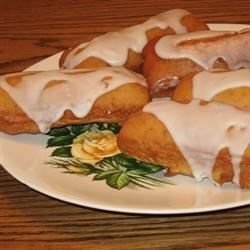 Sure wanted them to turn out, as my hubby loves long johns, and this is the only recipe I have found. My husband is a long John lover from way back when...so while he put the kids to sleep I made these and then he fried them up. He approved- he really liked them with chocolate frosting. Found them to be dense, needs to proof longer. Good when dipped in hot syrup and coated with coconut. These were delicious and made a lot!! I loved how easy the dough was to roll out. Will definitely keep this recipe. Thanks! !